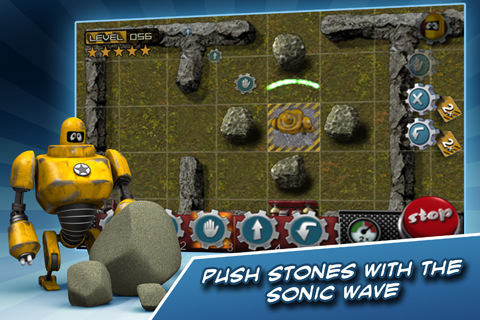 Guide a robot through dangerous terrain; over bridges, gaps, a wall of fire, and around death traps! Collect its parts so it can repair its programs and complete the mission! What mission you may ask? To take over the worl—wait, no… actually, it’s just to collect as much data about the planet as possible and fix yourself enough to get back to Earth. OF COURSE!!!! 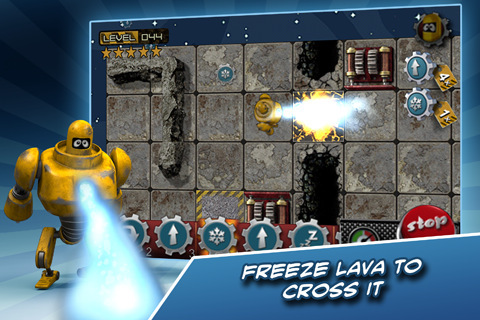 Robofix, released by Gamopolis GmbH, is available on the iPhone, iPod touch, and iPad for $0.99 and a Lite version is available. First of all, let me just say, I like the icon for this app. Cellshaded comicbook coloring and a really nice design. Ok, with that, let’s get right into the game. This is a unique premise. You have a long series of controls at the bottom of the screen with different functions. UP means that when the function is activated, the robot will move forward based on which direction it is facing. Left and Right are again, based on which direction it is facing. The functions only activate when you start it and it cannot be stopped until the entire thing is complete. There are ‘flawed’ functions somewhere in the line that will end up turning your robot around, into death traps, or just off target, which will result in a stage fail. Fix the ‘flaw’ in each program function and you’ll guide your bot to the proper destination. That was a mouthful of technical jargon, but that’s pretty much the entire game. Gameplay is very slow and analytical. You have to spend some time to plan your route, visualize the robot’s path per square, and you have to have patience to fail just because of a single failed move. Graphically, it’s bleh. Bleh as in Meh. Meh as in lacking of any real personality. The robot’s sprite is the biggest problem here since it’s from a top-down view so you don’t see much of our little bot and its design from above is not cute. Not at all. It’s not visually appealing. The backgrounds have a very nice look and feel to it however, but the character really should have been a 2D-ish, cell shaded character like in the icon. Give it cute proportions like Wall-E or something and you have yourself an app mascot. There are 100 missions on 10 different planets. That’s a whole lot of levels to play through. As you progress, you gain the ability to use lasers, freeze rays, and a sonic wave attack, but much of the game feels the same. It’s really rare for me to feel any form of excitement about playing Robofix. The pacing is nice, the tutorial is great in game, and the simplicity of the first dozen levels give you plenty of time to adjust to the controls and commands, but it just feel dry and unexciting. Play it Lite and see how you feel with it. I personally couldn’t feel much joy in playing it, but I do hope you like it enough to support Robofix’s development team so they can continue adding content, tweaking gameplay, and figuring out just the right formula to make this an exciting, interesting, and mind-exercising game app. Sample the free version of Robofix on your iPhone. AppSafari review of Robofix was written by Joseph Ho on January 27th, 2011 and categorized under App Store, Games, Puzzler. Page viewed 3054 times, 1 so far today. Need help on using these apps? Please read the Help Page.